Visit from here theCity Hall of Holy Cross of Tenerife, City Hall of The Gap and other City Hall. It can know but on the gastronomy of the islands canaries and to know on wines canarios. 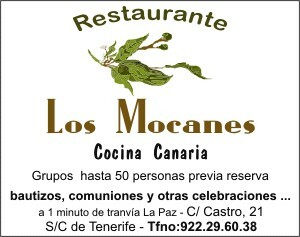 Information on theIslands Canaries and on hiking in Tenerife, Rent to car. It can find now you marry rural, rural tourism or to reserve its bill of ship with the company Fred Olsen. See the billboard of the main movies of the province and to consult the horoscope of the week. Restaurant La Hierbita - Restaurant in Santa Cruz de Tenerife. Saying of the day: Holy Rita and San Urbán, they remove wine and they do not give bread. Joke of the day: QUIENC*J*NESSEHALLEVADOLABARRAESPACIADORA? ?